Ash is back and this time heâ€™s back in time. Stuck in the times of King Arthur, Medieval times, trying to retrieve the book, as it is the only thing that can send him home Ash accidentally releases the army of the dead. Having cursed himself Ash must face of against an evil demon version of himself and save the earth before he can make his way home. Low and behold having the advantage of 21st century knowledge Ash uses everything in his arsenal to try and defeat the army of the undead. 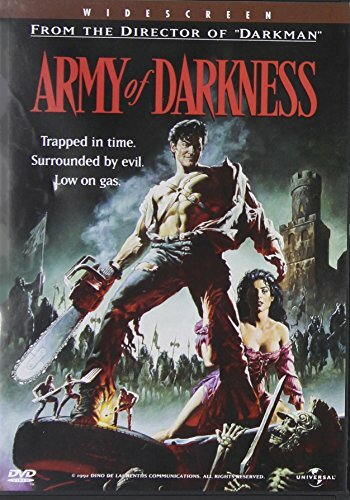 Having a much larger budget than both of its previous films, Army of Darkness stands out as the most popular of the series in the mainstream industry. Released by Universal Army of Darkness takes the vision of Sam Raimiâ€™s and helps him bring it to life. The story is something very original and carries the series even further than ever anticipated. With Bruce Campbell once again taking on the role of Ash it is the film that made him a star and a legend among B movie fans, with his magnificent role as Ash he completes the trilogy leaving us only to hope and pray that the Spider-man movies havenâ€™t turned Sam and Bruce away from where they got their start, definitely an A+ to have in any collection. One of my personal all time favorites is the Evil Dead series, if you enjoy this film you must see the other films.